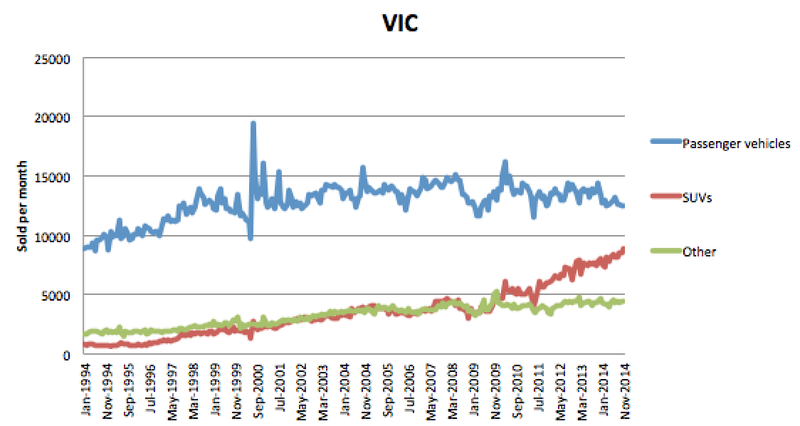 The SUV is rapidly becoming Australia’s favourite kind of car. In every state, SUV sales look set to outstrip sales of passenger vehicles soon, if they have not done so already. 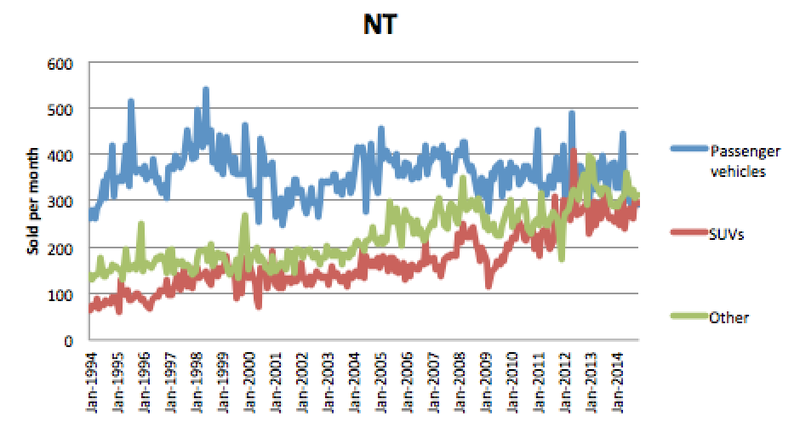 Congratulations NT, the only state where more SUVS are now sold than passenger vehicles. The Toyota Hilux, Mistubishi Triton, Ford Ranger and Hyundai i35 are among the top selling SUVs. SUVs are great. They’re safer for drivers, they give you a better view, they can mount any terrain, and they have lots of boot space. But they come with costs. More vulnerable road users get hurt. And we can see those costs across the whole country. The results for non-drivers are substantially more mixed than the results for drivers, which show clear falls. 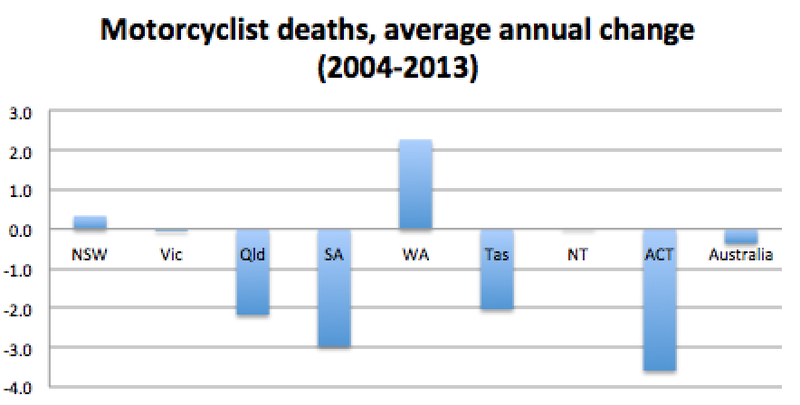 Some of the states with the biggest proportional increase in SUVs (especially Tasmania) show the worst results for pedestrians and motorcylists..
For comparison, here’s the rate of change in driver deaths. 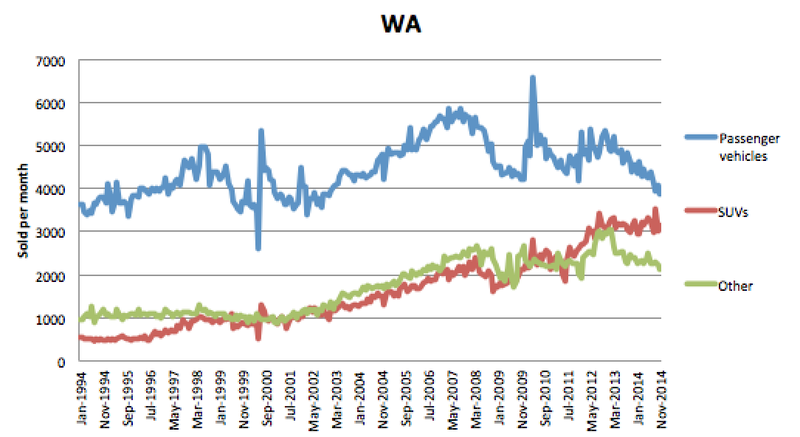 It’s worth noting that Tasmania’s population has been pretty stable in this time while WA has grown. These “hatchbacks on stilts” are a game theory problem. If everyone else has one, we want one too, to be able to feel safe and to see what’s happening on the road. They come with clear externalities. There is a case for the government to intervene. Everyone’s panicking about the falling oil price. Should we panic too? The price of oil has fallen an amazing amount in a short time. Which is sending global markets into a bit of a panic. 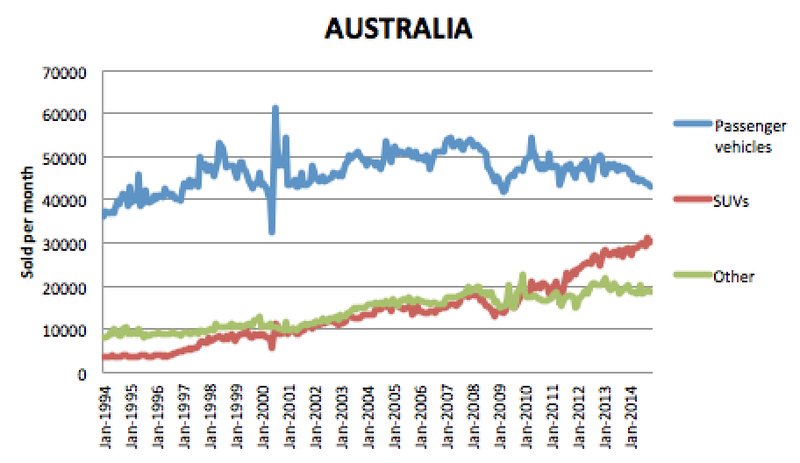 But is this really the moment where the Australian economy comes crashing down? Lower petrol prices are already a reality, which has the same effect for many households as a reduction in interest rates – more money in their pocket. 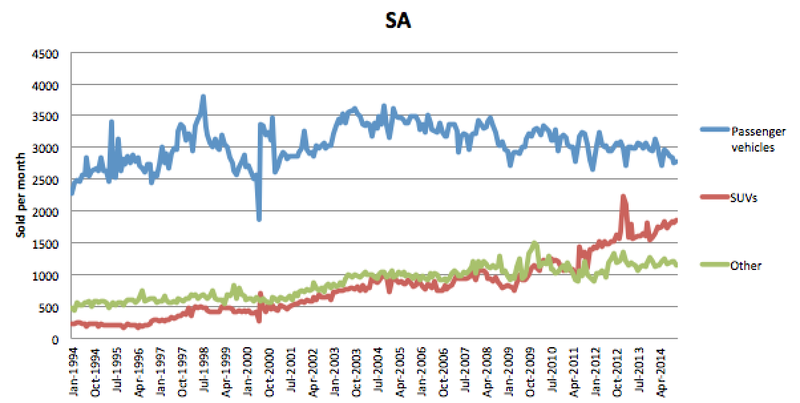 Since this graph was made a week ago, retail prices have fallen even further, to 2005-era levels of $1.20/L. The median household spends $40 a week on petrol, so a 25 per cent fall gives them $10 extra to spend on other things. This is a real boost to the Australian economy at a time when it really needs it. And our major trading partner, China, is in the same boat. It is an oil importer and it is apparently stockpiling fast during this period of low prices. 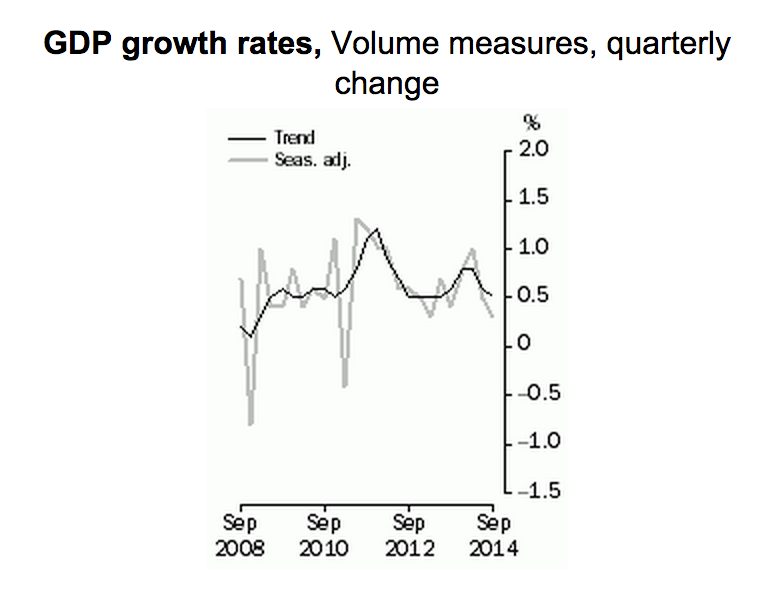 Like Australia, China is trying to get growth to continue without causing a surge in inflation. The oil price drop just made this a lot easier. If lower oil prices perk up the Australian consumer just as a lower dollar makes life easier for Australian business, and China is able to continue to grow strongly, that represents just about a best-case scenario for the Australian economy. But it’s worth remembering: What goes down can go back up. If consumers in China and Australia re-set their oil price expectations, and then the price of oil goes back up, it will feel like an interest rate hike – at the worst possible time. 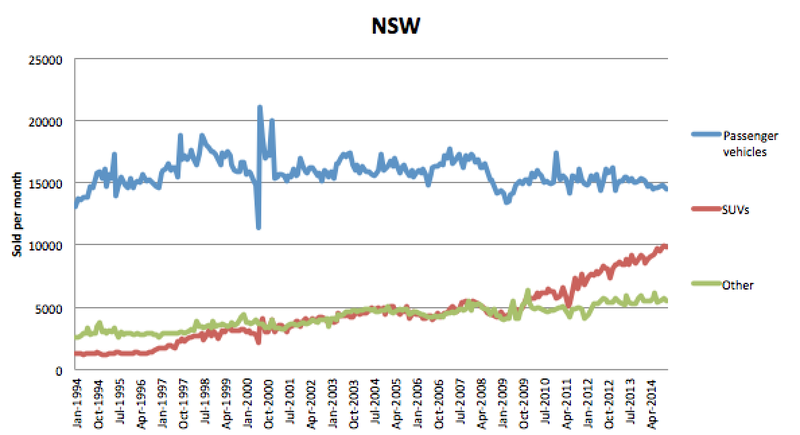 In that scenario, with Australian consumer confidence falling as China suffers a blow to growth, anything could happen. Posted on December 15, 2014 Author thomasthethinkengineCategories UncategorizedTags Australian economy, China, Economics, oil priceLeave a comment on Everyone’s panicking about the falling oil price. Should we panic too? Posted on December 12, 2014 December 12, 2014 Author thomasthethinkengineCategories UncategorizedTags Australia, budget 2015-16, economy, joe hockey4 Comments on Why this could be the summer Joe Hockey turns Keynesian. Bill Shorten should probably zip it about next year’s budget deficit. Next May, Tony Abbott and Joe Hockey are going to feel very uncomfortable indeed. They’ll be bringing down a Budget that is completely the opposite of what they hoped for. The 2014-15 Budget was full of spending cut plans and forecasts of rising tax revenues. The spending cuts are mainly in shreds on the floor of the Senate, and the rising tax revenue projections got vapourised by weak growth and falling iron ore prices. The few measures they did pass, like a temporary tax hike on high income earners, aren’t likely to be enough. The Abbbott/Hockey game plan was to get their horror budget out of the way early. But the ghost train didn’t stop at the station, and it looks like they’re stuck on the ride as it enters the tunnel once again. The Budget, when it comes out, is going to include some large negative numbers. They were expecting deficits of $30 billion this year and $17 billion next year. But revenue fell hard in the most recent quarter as growth fell to 0.3 per cent. I expect the government will be forced to admit the deficit this year is very much like the last Labor year (around $50 billion), and that the 2015-16 one will be at least twice the size they expected. What’s worse for them is this – the more they try to correct this scenario, the worse their reputations become. I wouldn’t want to face the dilemma Hockey faces – try to put the budget on track and cement once and for all the impression of having a heart of stone, or try to salvage a bit of popularity while letting the nation’s finances spiral away. Perhaps he will happily give up his job to Mr Turnbull. So, from a fiscal perspective, Opposition leader Bill Shorten has been given a free kick in the goal square. This is political gold! 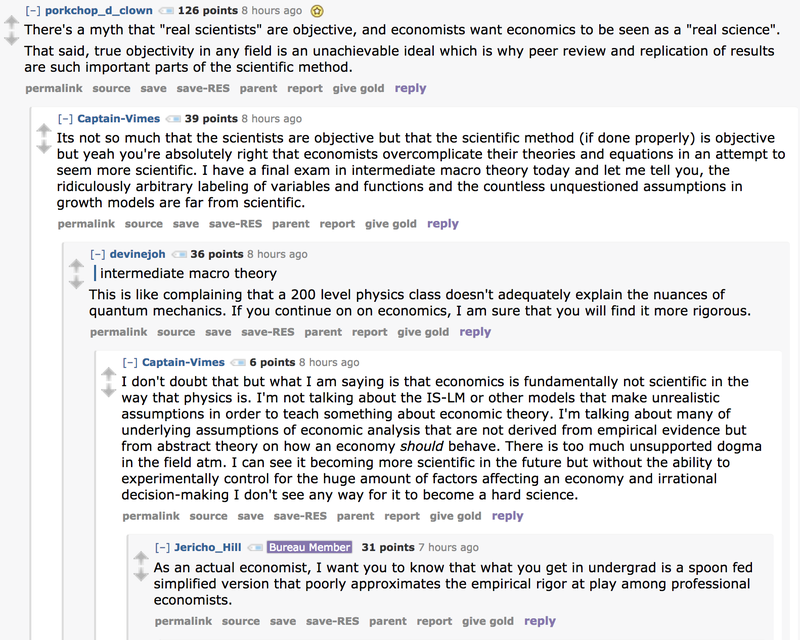 But should he go hard on this topic? Should he try to drive a fiscal stake through this government’s heart? I see three reasons he should not. The fear of deficits is extremely corrosive to our national debate. Governments are absolutely petrified of borrowing, for fear of being accused of running a deficit. The cost of borrowing, right now, is exceedingly low, and the benefits of borrowing could be very high. Almost everyone thinks Australia could use a big whack of infrastructure to set it up for the next century. Obsessing about spending only what you earn is for people who can’t get credit, or for people whose expenses are smooth and predictable. A mid-size first world nation can get credit cheaply, and might want to occasionally build a huge project. In those cases a deficit should be celebrated. If Shorten accusing Abbott of incompetence because of the existence of a deficit, then he further limits the policy options of all governments of all stripes. 2. Focus on something important. Budget day I argued in April that Labor should have made equality a big budget figure. You could hoard all the relevant data on equality until Budget day, brief the right people that an important measure was coming out that day, and then boom, get some cut through on a topic that wasn’t so meaningless. If Mr Shorten goes after Mr Abbott on the defict, he adds his imprimatur to the idea that managing a deficit is the most important job a government can have. Assuredly, it’s part of the government’s role. But to place it at the centre of responsibilities is to show a distinct lack of imagination. Find something important and make Budget day about that instead. 3. Tying your own noose. If Mr Shorten wins government in late 2016 and the deficit is all he’s talked about for the preceding three years, he’ll be forced to fix it, fast. That could prove uncomfortable for him. Mr Shorten’s approach will depend to some extent on what Mr Hockey has planned. We will know a but more about that once the mid-year economic update (MYEFO) comes out. “What is the last “cut” that is heralded as a major political reform? Howard strangled the dole payment down below some estimates of the poverty line, but that’s oddly omitted in his hagiography. Even right-wing economist Judith Sloan has argued the dole should now be raised. It will be very interesting to see what themes we can read into this year’s MYEFO (perhaps coming out next week, and required by law before the end of January). Posted on December 11, 2014 Author thomasthethinkengineCategories UncategorizedTags Australia, bill shorten, budget 2015-16, Economics, fiscal policy, joe hockeyLeave a comment on Bill Shorten should probably zip it about next year’s budget deficit. Time to start getting ready for when the robots take our jobs. When the federal Department of Industry starts investigating when robots will be taking our jobs, you know the possibility has gone from remote to real. A lot of jobs are at risk – half a million, according to the article – and they’re not “bad” jobs. I’ve written before about what will eventually happen to employment after the Robot Revolution. I think new skill-sets will rise to the top: people-skills and creative skills. The inspiration angle and the emotion angle will be our edge when robots are doing the physical and routine thinking work. In the mean time, automation will make things cheaper. More and more goods will be like water. Water is cheap. So cheap we don’t even think about it. Water is plentiful. You can easily get more than you could ever use. Its abundance makes it easy to forget that it is incredibly important. And many other goods and services are much like water. Energy, definitely. You no longer need to pay a fortune for firewood and paraffin. Electricity comes into the house at far less than our willingness to pay. You could argue clothing and food have already gone that way too. At certain very popular stores, you could buy a complete outfit, including shoes, for under $40. You can meet your daily energy needs for a couple of dollars. We don’t talk much about how awesome this is. But it is incredible. It’s why absolute poverty doesn’t exist in the same way any more. Being poor is still a huge disadvantage, but has more to do with access to other needs like healthcare and housing and opportunity and with the challenges that poses to decision making, than simple starvation. When people complain, saying things becoming cheap strips them of their value, they don’t realise the alternative. Indulge me for a moment longer, let’s imagine prices going the other way – from free to expensive – and instead of using water as our example, let’s use air. Air is abundant and cheap, and we barely think about it. Should we charge for it? Would that make people value it? Charging for air would be great for GDP. The whole population would be customers of the various air providers. Maybe they’d pre-pay, maybe they’d be on a plan (don’t go over your cap!). The government would set up a means-tested scheme to provide free air for certain groups. Still, it would be a big bump to the economy, and there’d be a lot of jobs in it. Jobs! Given how politicians love to promise jobs, I’m surprised charging for air isn’t on their radar. So I hope I’ve convinced you, via these examples, that cheaper goods and fewer jobs is not necessarily bad. It can be good, in part. But it will not be uniformly good for social outcomes. Here’s how the Department of Industry sees it. The advance of the robots will not be uniform, and there will be times when lots of people get put out of work all at once. At these times, the returns to capital will be higher, and the returns to labour will be lower. In these times, panic will rise. Even though a future where humans are all out of work is laughably implausible, it might not seem that way if you and everyone you know just got the sack. We will need policy settings that will help at these times. The policies could try to prevent the robots from taking the jobs, but that means forfeiting the benefits in terms of cheaper goods. It would also be incredibly hard to implement. So what is the best way to make sure we’re ready for a bump in unemployment? What’s the best way to make sure people are ready to get back into the workforce? 1. Invest in education now. Education protects against long-term unemployment according to the data, probably by making people ready to re-learn. This is not the time to be making university educations more expensive. Quite the reverse. It’s also the time to be investing in making sure nobody falls through the cracks. Proper implementation of needs-based school funding, in the manner suggested by David Gonksi, would be a good way to make sure that people are adaptable when the time comes. 2. Stop starving the beast. The federal deficit is growing, and since the government has failed to implement a range of spending cuts, and is opposed to tax hikes, it will probably keep growing. In the future, we may need to exploit the federal government’s ability to provide Keynesian stimulus via the “automatic stabilisers” that are welfare payments. Bulking up the budget is necessary, and we probably need to push up the tax-to-gdp ratio. It may seem like an economically sensitive time to be lifting taxes, but that’s not the case if you put land tax on the agenda. Unlike taxes on income and companies, land taxes are not a tax on productive activity, plus they tend to be progressive (rich pay more, poor pay less). With these policies in place, we should be much better placed to welcome the robots as our servants, not our rivals. Posted on December 10, 2014 December 10, 2014 Author thomasthethinkengineCategories UncategorizedTags Economics, jobs, policy, robots1 Comment on Time to start getting ready for when the robots take our jobs. 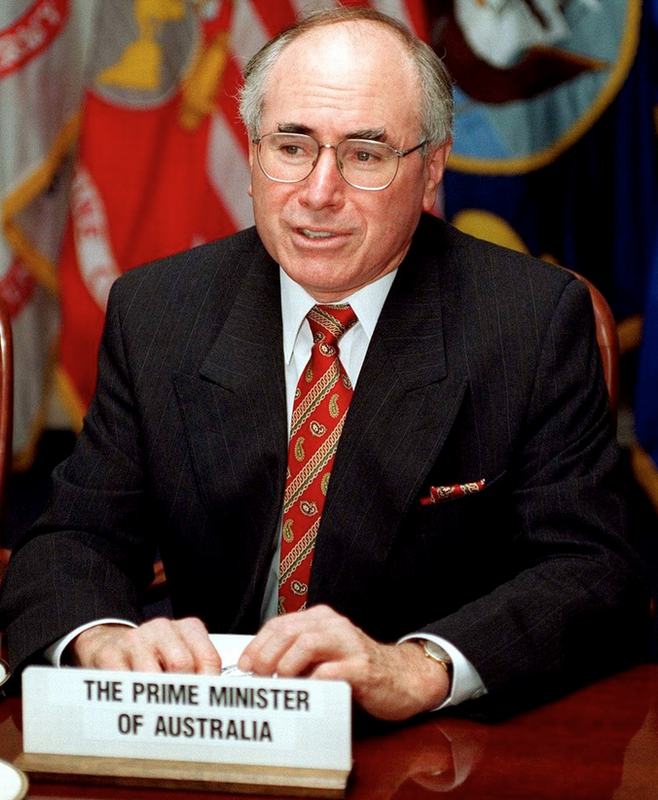 The man to sell tax hikes to the Australian people … is John Howard. Australia’s budget is in a spot of trouble. 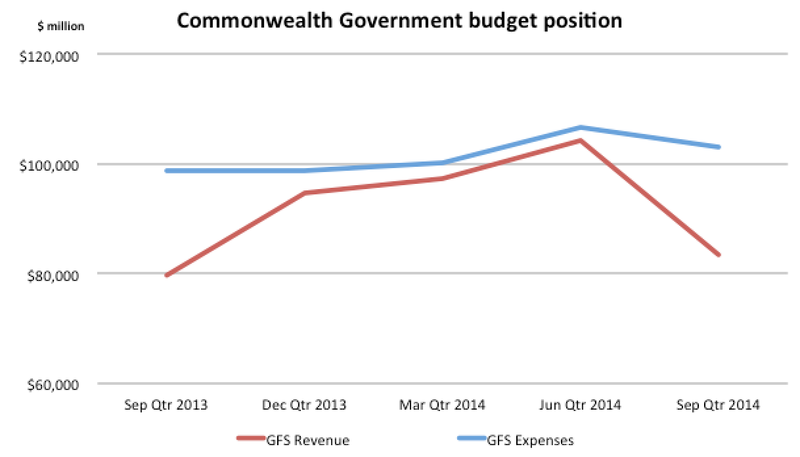 The ABS released its latest Government finance statistics this week and they show a slump in revenue. This, to me, is not a crisis. It’s not good news, but just as you don’t judge a game of football on a 2 minute period, you don’t judge a fiscal situation on a quarter (or even a year, or even a group of years). You ned to judge the fiscal position in the long run. I’m interested in this high-level measure, the tax-to-gdp ratio. And that’s an interesting thing, with a few moving parts. Treasury has relatively recently begun spruiking it. 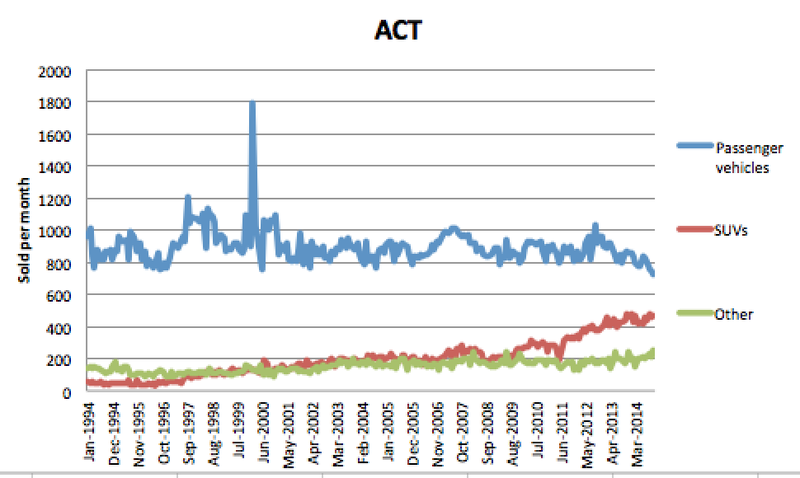 (This began in the Rudd era, I believe, when he wanted to seem fiscally prudent while spending a lot.) It can be affected by deliberate actions of government, or by shifts in GDP and prices of key exports. That spike in the red line at the end is now at risk, due to factors beyond the government’s control. In the 2014 Budget, the government announced it would increase revenue as a percentage of GDP, from 23 per cent to 24.9 per cent. Given the way everything economic and budgetary has come up turds since, the MYEFO is likely to replace this optimistic assumption when it comes out (soon). A 1 per cent fall in the terms of trade is estimated to have a $2.6 billion impact on the budget, according to published sensitivty analysis. 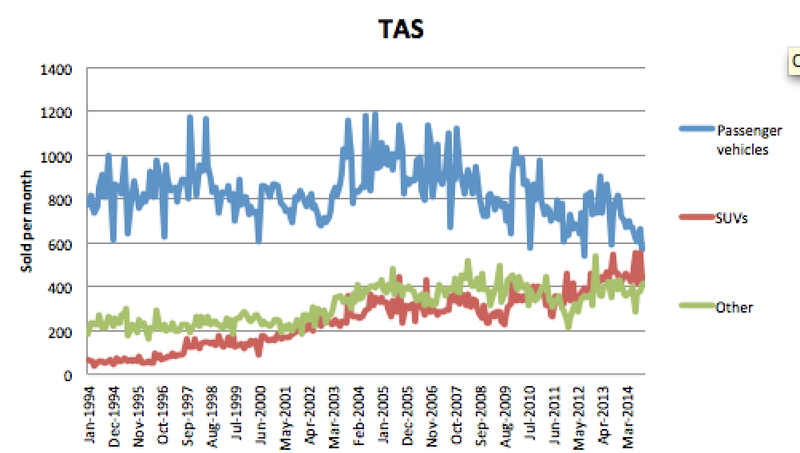 And this week’s national accounts show an 8.9 per cent fall in terms of trade over the last 12 months. 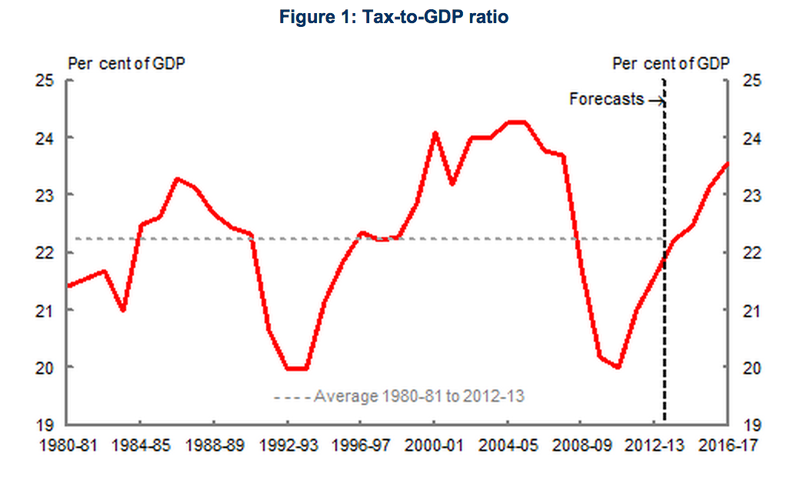 So we’re likely to get a budget deficit that is expanding and a tax to GDP ratio that is falling. So what should the government do? In the short-run, it should keep spending to prop up growth. But in the medium to long run it needs to do more. The most senior figure in Australian economics, Max Corden, strips the issues back to their essentials in the Conversation today. Cutting spending is important where programs are ineffective, or where you’re trimming fat. That is crucial. But it won’t be enough. The Australian people want the government to do more, not less – we want important things like the NDIS and funding childcare and kindergarten. I’d support raising taxes, slowly and in a clever way, to try to right the structural budget deficit. This might seem like an impossible PR job for the government. But with the help of one man, it may not be. The name John Howard is like a magic charm in contemporary politics. A man who wins four elections (96, 99, 2001, 2004) gets a lot of kudos in retrospect, even if he had a seriously easy incumbency, bountiful in threats to national security and bumps to government revenue. Mr Howard presided over an era that saw the tax-to-GDP ratio rise over 24 per cent, even as he gave away income tax cuts as fast as he could. People remember that time fondly. The song that pleaded for us to not take a rose coloured glasses view of his legacy? That record broke. The man is viewed (wrongly) as a fiscal genius.If I were Joe Hockey, and I was facing up to the fact I needed to to try to sell tax hikes, I’d stick his name on it. Posted on December 5, 2014 December 5, 2014 Author thomasthethinkengineCategories UncategorizedTags auspol, Australia, Economics, joe hockey, John Howard, Tax3 Comments on The man to sell tax hikes to the Australian people … is John Howard.